Little update. I stole a client from Nissan...sry. 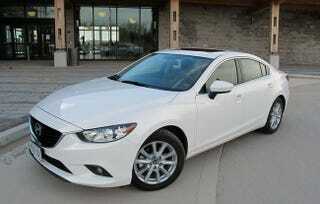 My father now loves the Mazda 6 2014 in white! He forgot the Altima as soon as he saw it. We saw Buicks but it didn't do it for him at the gm dealership (except for a GMC Terrain which was totally unexpected). Same for the Ford Fusion. Now the thing is...it's not as equiped as the Altima for the same price and the other issue is that, it's a little more expensive than the Altima per month. He doesn't like that fact, but I'm willing to put money on it if he really likes it. He got the Altima for 32000$ fully equiped with winter and summer tires. Any other car suggestions for under 32000$ that is fully equiped.